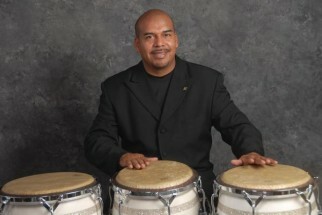 Charlie Chavez is virtuoso percussionist performing on the full spectrum of percussion instruments. He also is a dedicated Educator and Bandleader. Charlie Chavez was born in Juchitan Oaxaca and grew up in Coatzacoalcos Veracruz, Mexico – which is rich with Cuban and Caribbean Rhythms. He studied at the Conservatory of Music at the University of Xalapa Veracruz from 1996 to 2000 studying Trombone, Percussion and Piano. He moved to Tijuana in 2001 and began working there and in San Diego. In 2001 he toured Europe and the United States with Lila Downs and Maldita Vecindad. He has performed and shared the stage with some of Jazz and Latin music’s greatest artists including Poncho Sanchez, Charles McPherson, Gary Burton, Chuchito Valdez, Raul Pineda,The Spanish Harlem Orquesta, Denise De Kalfe, Iraida Noriega, Israel Varela, The Celia Cruz Orchestra de Los Angeles and Paquito D’Rivera. He has become one of the most important percussionists in Southern California performing with The Gilbert Castellanos Latin Jazz Ensemble, The Dave Scott Jazz Trio, The Orquesta Binacional de Mambo, B side players, The Allan Phillips Project and Agua Dulce. He heads his own salsa group “Afrotruko which has performed at major venues and festivals in Southern California. He has performed in percussion clinics in Mexico City, Humbolt University and The Berklee School of Music in Boston. He has also organized master percussion workshops in San Diego bringing in World Class Percussionists Georgie Padilla, David “La Mole”Ortiz, Tomasito Cruz, Pablito Rosario and William Kachiro Thompson. He leads weekly percussion classes in Tijuana and San Diego. He is also a guest instructor at Mesa College in San Diego. He has recorded with The TJ All Star Leyendas de Tijuana., Orquesta Pico de Gallo, “Vengo del Desierto”, Gene Perry “Mi Tambor Lo Dice Todo”, Oscar Aragon “Vida”, Sacha Boutros “Simply Sacha” and Taylor Hicks, “The Distance”. Red hot salsa with beats that will keep you on your feet!